Regarded by many as one of the most attractive of all palm trees the Kentia Palm, ‘ Howea forsteriana’ is used both as an indoor plant and in the garden. Grown for the lush green foliage that brings a tropical look, the leaves as long and slender and the plant has a natural upright habit. This naturally elegant palm is a native to Lord Howe Island, however has been widely grown in Europe for nearly 200 years. In suitable outdoor situations, Kentia Palms may reach up to 20m however this is usually in an environment where it grows as an understory tree or in dense colonies. As an indoor plant Kentia Palms are much more restrained and will reach from 4- 10m depending on conditions and pot size. In the garden it is also naturally lower growing especially in a more open position where it does not need to reach for the light. An elegant palm with dark, lustrous arching fronds coming from a single trunk. Its attractive shape makes it most desirable for interior decore. 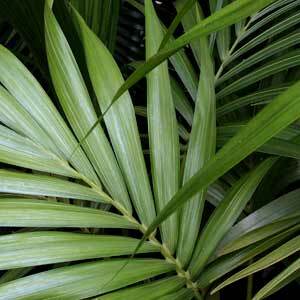 Kentia palms are naturally an understory tree and they prefer indirect light, this makes them an excellent option for indoor low light situations. They also grow well in a humus rich soil with good drainage. Although they are hardy once established, frosts can damage the tender new foliage. Direct hot sun can also scorch foliage and detract from the appearance. Grown indoors you will need to fertilize once or twice a year. A general purpose low phosphate type will be sufficient. In containers you will need to renew the potting mix every 3 – 4 years. Simply lift the plant from the pot, remove some of the old potting mix (minimum root disturbance) and repot using new potting mix. Water in well after repotting. When grown indoors try to rotate to a sheltered outdoor position every 6 weeks for a week or so. Only water when the soil begins to dry on the top. Overwatering can cause root problems. A lack of water can cause the foliage to yellow and brown. Use water that has been allowed to sit overnight, this allows it warm a little. If the foliage is beginning to droop, it may be an indication of lack of water. Never let the plant sit in a saucer of water. In containers use a slow release type fertiliser once every 6 weeks. Specialist palm tree fertiliser are available that are low in phosphates. Outdoors, when growing in the ground, use well rotted compost and some aged cow manure to mulch around the plant each year. Avoid any unnecessary pruning, only remove old dead foliage. Pruning away good foliage can cause the trunk to split and allow fungal problems to set in. Although these are a relatively problem free plant a few problems can arise. Kentia palm leaves turning brown is often an indication of a lack of light and to much water. To much water deprives the root system of oxygen. A build up of salts from fertilisers in the potting mix can also cause the leaves to turn brown. The same problem can be caused by a lack of water and very dry air. Brown spots on foliage – Usually caused by sun scorch. However also by very low humidity if grown indoors and by lack of water. Yellow leaf tips – Usually caused by overwatering. Brown leaf tips – Sometimes caused by chlorine in tap water, let water sit in a bucket overnight to allow chlorine to burn off before watering.